Caddell On Romney: "This Is The Worst Campaign In My Lifetime"
"I swear to God, everything we have been saying for months, and I know a lot of the audience doesn't want to hear this, this is the worst campaign in my lifetime," Democratic pollster Pat Caddell said on the Monday edition of FOX News' "Campaign Insiders" web show. "A challenging campaign, with a chance to win. They have set themselves on a course that says, 'We don't have to do anything, we're going to win because they don't like the other guy.'" "Obama's fighting for his life, his party is fighting for their life, and they're winning. 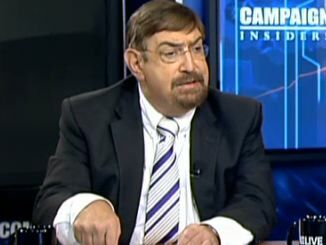 This is, I've said all along, this is Romney's election to lose and by God he's losing," Caddell said. "That 50% approval rating -- if the president is at 50% approval, it is hundreds of millions of dollars raised and spent by Republican and conservative consultants and organizations have failed. They have failed because they have no real credibility as a message. If he's at 50%, somebody needs to sit down and rethink," Caddell said. "Republicans have no response mechanism. Hundreds of millions of dollars, they're still not on the air explaining to people that with the labor participation rate, if it was the same as he came into office the unemployment would be 11.2%. There is a missing case and I watched Romeney yesterday, I watched Romney yesterday, I swear to God, there is no urgency to this man. He is running, as I said this morning, bored," Caddell observed. "And the fact of the matter is, we're heading for a major crisis. You see it coming, 'Here are the three or four things that I'm going to do, we must make a change.' He has no message other than 'i'd like to win and by the way I have a secret formula.' He may still win with his, but not if Obama's at 50% approval," he added. "They're strategists from the beginning have decided -- I just, you know can't say enough bad things about them. They are incompetent, that believe that you can sit and election will automatically come to you. And that they don't respond. They never sold Romney with the message that we talked about for months and I'm sorry to the audience out there. It's not the American people are stupid, your candidate is stupid," Caddell said. "They never gave his message of who he is." Krauthammer To Muslim Protestors In Egypt: "Go To Hell"
Ed Rendell: "Even People Who Lost Their Jobs Are Better Off"
CNBC's Joe Kernen: Paul Krugman A "Communist"